Interstate 490 in Ohio connects Interstates 90 (Northwest Freeway) and 71 (Medina Freeway) with Interstate 77 (Willow Freeway) between the Tremont and North Broadway neighborhoods in central Cleveland. The urban freeway represents a short portion of the original Clark Freeway proposed east from the Innerbelt (I-90) to the Outer Belt East Freeway (Interstate 271) at Beachwood and Pepper Pike. The Interstate 490 connector was first envisioned as part of an urban loop taking Interstate 80S from the Parma Freeway (planned I-90) east along the Clark Freeway to the Bedford Freeway across central Cleveland. 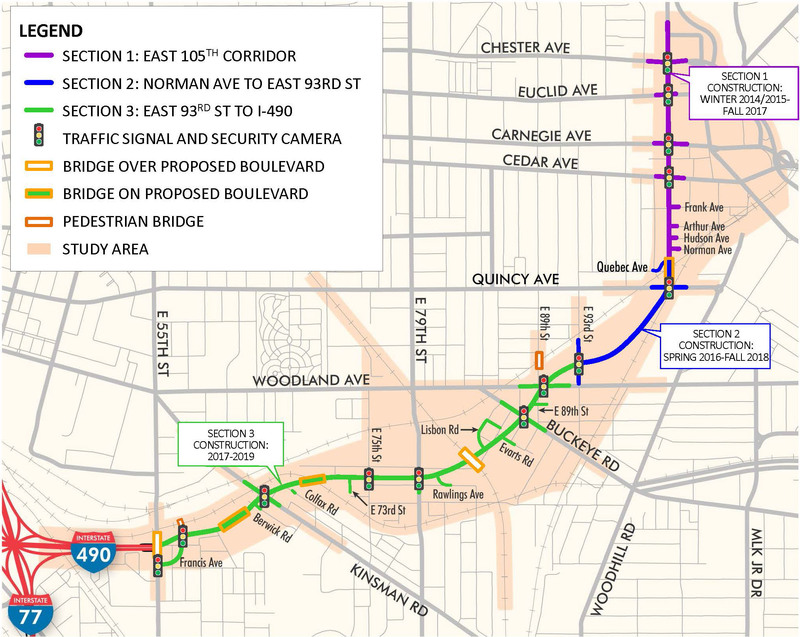 I-290 was proposed to extend the Clark Freeway east from the Bedford Freeway at the Kinsman neighborhood to the Outer Belt East Freeway at Beachwood, where it would overlap with I-271 north to I-90 in Lake County. Increasing community opposition throughout the 1960s led to several freeway cancellations, including all of the Clark Freeway east from North Broadway. The redesignation of Interstate 290 to 490 was approved by AASHTO on November 10, 1973. The change redefined the eastern terminus from I-271 and Shaker Heights to Interstate 480 at Maple Heights. The southeastern route to Maple Heights (Bedford Freeway) from East 55th Street was never built, with the exception of the trumpet interchange and access road between I-480 and Broadway Avenue at Exit 23. Interstate 290 would have continued due east from the Interstate 90 northward turn at I-71 to Shaker Heights and Beachwood. 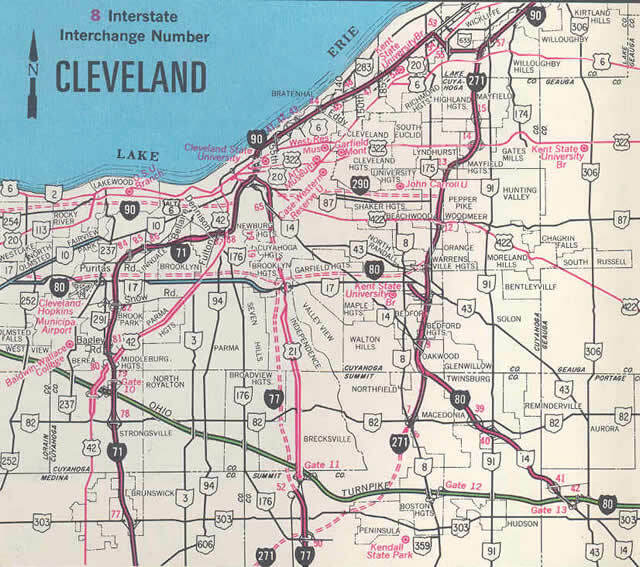 The earliest proposal for what would later become part of Interstate 490 incorporated a portion of the Interstate 80N loop north from Ravanna to Cleveland and west along Interstate 90 to the Ohio Turnpike. The southeasterly jog of I-80N to Maple Heights was later incorporated into a proposed reroute of I-490 to Maple Heights before the route was dropped all together east of 55th Street. 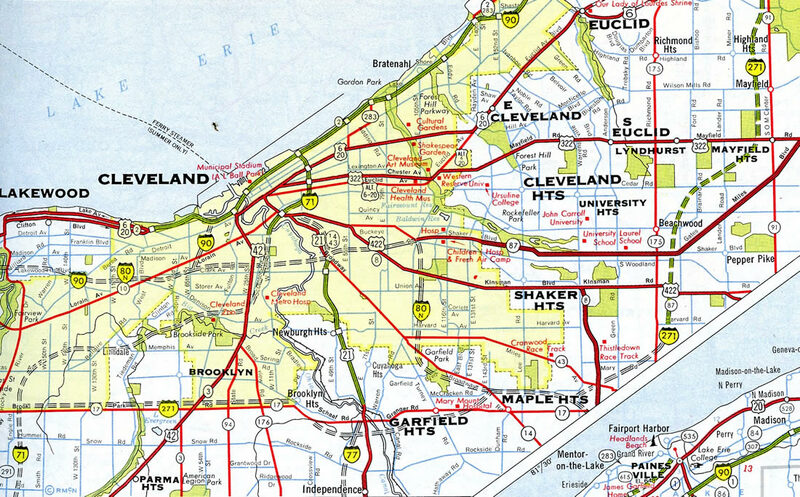 The Cleveland Innerbelt study conducted by the Ohio Department of Transportation (ODOT) starting in fall 2000 included two alternatives involving new construction between Interstate 490 and the University Circle neighborhood in northeast Cleveland. One concept extended the freeway along railroad right of way northeast to Interstate 90 at East 133rd Street and the Forest Hills neighborhood. The second alternative outlined an at-grade boulevard between I-490 and East 105th Street along the same railroad corridor. 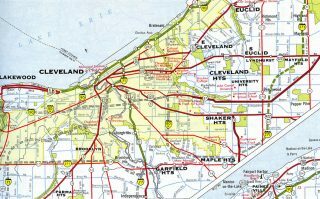 The freeway plan included interchanges at East 55th Street, Kinsman Road, Woodland Avenue, Stokes Boulevard, Euclid Avenue, Superior Avenue, St. Clair Avenue and East 133rd Street. The alternative was estimated to cost $1.5 billion and displace 165 residences. Community opposition from East Side neighborhoods ranged from activists, residents, Council President Frank Jackson and Cleveland Mayor Jane Campbell. Section 1 – Upgrades to East 105th Street from Quebec Avenue to north of U.S. 322 (Chester Avenue). Construction started in winter 2015. Section 2 – New roadway from East 93rd Street to Quebec Avenue. Construction started in spring 2016. Section 3 – New roadway from Interstate 490 and East 55th Street to East 93rd Street. Construction to begin in 2017. See detailed schematics of the Preferred Alternative on the ODOT web site. A loop ramp connects West 7th Street and the Tremont neighborhood with Interstate 490 east, one mile ahead of Interstate 77. Photo taken by Tim Kubat (04/06). End Interstate 490 overhead posted as the freeway crosses the Cuyahoga River and adjacent industrial areas. Photo taken by Tim Kubat (04/06). A half diamond interchange (Exit 2A) joins I-490 east with Ohio 14 (Broadway Avenue) along the west side of Interstate 77. Photo taken by Tim Kubat (04/06). The four eastbound lanes of Interstate 490 partition with two lanes leading to I-77 and two continuing to the freeway end at 55th Street. I-77 curves northwest to end at Interstate 90 east outside Downtown. The freeway south travels to Independence and Akron. Photo taken by Tim Kubat (04/06). Beyond the ramps for Interstate 77 ramps, the remaining lanes of I-490 connect to East 55th Street at the North Broadway community. Photo taken 09/30/10. East 55th Street heads north from the I-490 freeway end to U.S. 422 & Ohio 8 (Woodland Avenue west / Kinsman Road east) and Ohio 87 (Woodland Avenue east) at the Central neighborhood of east Cleveland. Photo taken 09/30/10. Interstate 77 northbound enters the Cleveland city limits from Newburgh Heights, 1.25 miles south of Interstate 490 west and East 55th Street (Exit 161B). Photo taken 09/30/10. Paralleling East 49th Street, I-77 advances north from the North Broadway neighborhood 0.75 miles to Interstate 490. Photo taken 09/30/10. Back to back half diamond interchanges join Interstate 77 north with Pershing Avenue (Exit 160) and Ohio 14 (Exit 161A) preceding Interstate 490. Sign changes made by 2011 reference the permanent closure of the I-77 north to I-90 westbound ramp at Downtown Cleveland. Interstate 490 provides that movement not. Photo taken 09/30/10. Lowering to pass under Ohio 14 (Broadway Avenue), Interstate 77 sees a lane drop for the four-level interchange (Exit 161B) for I-490 west and the freeway spur to 55th Street. Photo taken 09/30/10. Exit 161B leaves Interstate 77 north for I-490 west to Tremont, I-90 west to Ohio City and the I-71 southwest to Brooklyn. The freeway end at 55th Street links with industrial areas south of U.S. 422 at Central and North Broadway. Photo taken 09/30/10. This overhead assembly at the Fleet Avenue overpass in South Broadway, Cleveland was replaced by 2007, then moved to a new sign bridge along sign a variable message board by 2010. Photo taken by Tim Kubat (04/06). All remaining button copy signs for Interstate 490 on I-77 were replaced by 2007. Photo taken by Tim Kubat (04/06). Forthcoming Interstate 490 west spans the Cuyahoga River to link I-77 with Interstates 71 and 90. Photo taken by Tim Kubat (04/06). Exit 161B departed from I-77 north at the SR 14 (Broadway Avenue) overpass. Toledo is the control city, referencing the connection with I-90 west to the Ohio Turnpike (I-80). Photo taken 02/25/02. Interstate 77 narrows to four overall lanes as it spans I-490 and all associated ramps. Photo taken 02/25/02. Interstate 77 initially travels east along side U.S. 422 and Woodland Avenue before curving south along a viaduct leading to the four-level interchange (Exit 161B) with Interstate 490. Photo taken by Tim Kubat (04/06). Exit 161B parts ways with Interstate 77 south at the viaduct end for I-490 west to Interstates 71 south and 90 west and nearby East 55th Street at North Broadway. Photo taken by Tim Kubat (04/06). Leaving East 55th Street, the I-490 freeway quickly splits with the unnumbered ramps for Interstate 77 north to Downtown and south Interstate 77 (Willow Freeway) north to downtown Cleveland and south toward Akron. Photo taken by Tim Kubat (04/06). Ramps from Interstate 77 (Willow Freeway) and Broadway Avenue (old U.S. 21) merge onto Interstate 490 at the Cuyahoga River bridge. The freeway proceeds west to Tremont and Interstates 71 south (Exit 1A) and 90 west. Photo taken 09/30/10. Back to back lane drops occur at Exit 1A for the flyover joining the west end of I-490 with I-71 south. Interstate 71 splits with Ohio 176 (Jennings Freeway) nearby. Photo taken 09/30/10. Interstate 71 extends south from the Innerbelt Freeway (I-90) to run west to Riverside in Cleveland, Cleveland-Hopkins International Airport (CLE) and the suburb of Brook Park. Photo taken 09/30/10. Interstate 490 west defaults onto Interstate 90 (Northwest Freeway) west to Cudell, Jefferson and Kamms Corners in west Cleveland. Photo taken 09/30/10. The flyover carrying motorists from I-490 west to I-71 south forms a distributor roadway connecting with the Medina Freeway mainline leading to Brooklyn Center and the Jennings Freeway (Ohio 176) south to I-480. Photo taken 09/30/10. Crossing Industrial Valley and the Cuyahoga River, Interstate 490 passed under this set of button copy signs for Interstates 71 and 90. Photo taken by Tim Kubat (April 2006). Sign changes made for Exit 1A added panels for Ohio 176, reflecting the 1998-completed Jennings Freeway. Photo taken by Tim Kubat (April 2006). Interstate 490 travels below the Medina Freeway and the three flyovers joining Interstates 71 and 90. Milepost zero stands ahead at the gore point bringing I-90 west from the Innerbelt Freeway. Photo taken by Tim Kubat (April 2006). The first sign for Interstate 490 (Exit 170C) appears along Interstate 90 (Northwest Freeway) east at Exit 169 to West 41st and 44th Streets in the Detroit-Shoreway neighborhood. Photo taken 09/30/10. West 41st Street crosses over the four eastbound lanes of I-90 as the Northwest Freeway enters the Ohio City Near West Side neighborhood. The left-hand two lanes default onto Interstate 490 east in 0.9 miles. Photo taken 09/30/10. U.S. 42 leads north to Superior Avenue east to end at Public Square in Downtown. Interstate 90 also reaches Downtown via the Innerbelt Freeway, which extends north from the ending Medina Freeway (Interstate 71). Traffic headed to Interstate 77 south from I-90 east must use I-490 as the north end of I-77 is no longer accessible from the Innerbelt east. Photo taken 09/30/10. Interstate 90 utilizes a two lane flyover to turn north onto the Innerbelt Freeway to Downtown Cleveland as I-490 begins with three eastbound lanes. Photo taken 09/30/10. Exit 170B branches south from four-level interchange at the Innerbelt Freeway to both Interstate 71 (Medina Freeway) southwest to Brook Park and Columbus and Ohio 176 (Jennings Freeway) south to I-480 at Parma and Brooklyn Heights. Photo taken 09/30/10. Button copy signs formerly posted for Interstate 490 east and U.S. 42 at Exit 169. Photo taken by Tim Kubat (April 2006). Spacing allotted for a I-490 control city was eliminated with replacements made along I-90 east by 2010. Photo taken by Tim Kubat (April 2006). 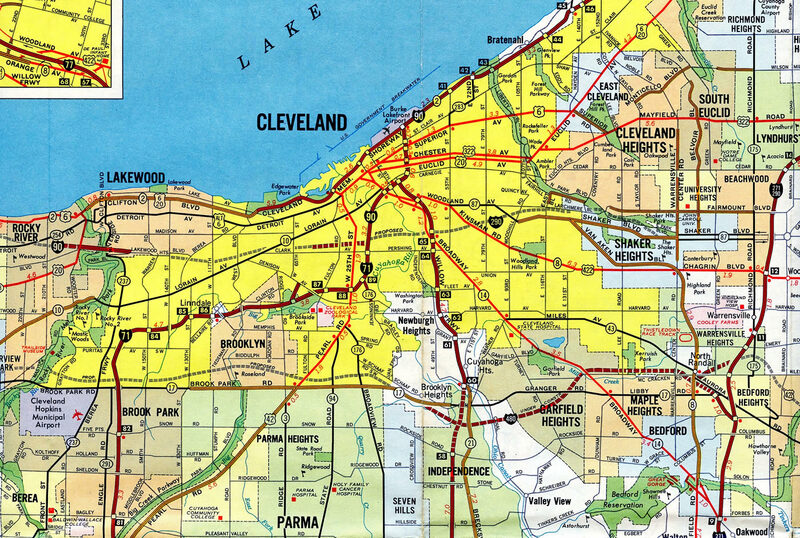 Interstate 71 (Medina Freeway) leads east though the Brooklyn Centre neighborhood of Cleveland to collector distributor roadway (Exit 247B) for Interstates 90 and 490. Photo taken by Tim Kubat (April 2006). U.S. 42 & Ohio 3 span I-71 at the Clark-Fulton neighborhood as Interstate 71 curves northeast to merge with the north end of Ohio 176 (Jennings Freeway). Two lanes continue north onto I-90 (Innerbelt Freeway) east while a c/d roadway and Exit 247A depart for West 14th Street and Interstates 90 and 490. Photo taken by Tim Kubat (April 2006). I-71 north elevates to pass over the northbound lanes of Ohio 176 at a wye interchange. The separation for Interstates 90 (Northwest Freeway) west and 490 east follows from the viaduct. Photo taken by Tim Kubat (April 2006). Including the c/d roadways, five roadways run north-south through the Tremont neighborhood between MetroHealth Medical Center and the Steelyard Commons retail center. The northbound lanes of I-71 partition with the c/d roadway for I-90/490 along the viaduct as Exit 247A departs to Clark Avenue and Steelyard Drive. Photo taken by Tim Kubat (April 2006). 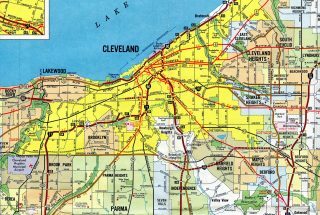 Ohio 176 (Jennings Freeway) winds north from Interstate 480 through the Old Brooklyn neighborhood of Cleveland to Big Creek. The freeway connects with Interstates 90 and 490 in two miles. Photo taken by Steve Hanudel (06/18/06). North of Big Creek, Ohio 176 travels through the Brooklyn Centre neighborhood to the merge with Interstate 71 ahead of I-90/490. Departing here is the off-ramp for Denison Avenue to Harvard Avenue and the village of Newburgh Heights. Photo taken by Steve Hanudel (06/18/06). Ohio 176 (Jennings Freeway) north approaches Interstate 71. Rather than merge with I-71 directly, the two roadways form a double deck freeway to the collector distributor roadway for Interstates 90 west and 490 east. Photo taken by Steve Hanudel (06/18/06). Traveling below I-71, the next exit from Ohio 176 departs for a roundabout joining West 14th Street with Quigly Road. 14th Street south connects the Jennings Freeway with Interstate 71 (Medina Freeway) south at Clark-Fulton. Photo taken by Steve Hanudel (06/18/06). North beyond 14th Street, Ohio 176 emerges from the double deck freeway to split into single lane ramps for the ending Interstate 71 to I-90 (Innerbelt Freeway) east and a slip ramp for the c/d roadway to I-90 (Northwest Freeway) west and I-490 east. Photo taken by Steve Hanudel (06/18/06). An end sign for Ohio 176 appears at the separation of traffic for I-90 east to Downtown and the c/d roadway for I-90 west to Lorain and I-490 east to Interstate 77 and the North Broadway community. Photo taken by Steve Hanudel (06/18/06). Clark Avenue spans Interstate 71 and the c/d roadways as traffic partitions for Interstates 90 west and 490 east. There is no longer access from I-90 (Innerbelt) east to I-77 south due to the Innerbelt Project. I-490 instead provides the connection. Photo taken by Tim Kubat (April 2006). “Two Interstate 77/90 Ramps to Close Permanently as Part of Innerbelt Work.” Ohio Department of Transportation, April 5, 2011. “Connecting I-490 to University Circle – An Examination of the Economic and Community Development Impacts of ODOT’s East Side Alternatives on affected City Neighborhoods and University Circle.” https://www.dot.state.oh.us/projects/ClevelandUrbanCoreProjects/OpportunityCorridor/Documents/OCI490ConnectorStudy.pdf Ohio Department of Transportation, February 2002. Opportunity Corridor – Project Overview. Ohio Department of Transportation project web site. Accessed April 13, 2016. Page updated July 24, 2017.